The greatness of a community is measured by the compassionate actions of its members, a heart of grace and a soul generated by love and one of the loveliest abilities of the Dawoodi Bohra community is the way we translate our love, our generosity, our grace and compassion in our food and the way we serve it. Our food is the canvas of our culture and traditions and the Thaal is the nucleus around which our family, friends and sunshine revolve. Food is memories, food is comfort and when we sit around our Thaal, we not only feed our bodies but satiate our souls and relationships. There is nothing more comforting than to reach home, relax and share the day’s happenings with loved ones, over a delicious and warm meal. So what is the story of our food and the Thaal that actually offers us more than a meal. The dawoodi bohras are an ethnic blend of Arabic, Persian, Yemeni, Egyptian, African Pakistani and Indian cultures and so our food is a significant diaspora of multiple exotic cuisines and flavours. Our food will take you through the streets of Sana’a and Aden and give you an aroma of the Yemeni countryside. It will give you a glimpse of the indigenous rainbow cuisine that colours the streets of Africa, it will walk you through the fragrant Arabic, Persian and Egyptian suqs and snare your palette and back home it will capture the rich spices and tadkas that linger in every corner of India and Pakistan. Our meals follow a unique pattern. We start with a grain of salt which acts as a taste cleanser and after activating the taste buds, we are off to a sweet beginning. We call it the ‘mithaas’. And some of our signature dishes are the malida, kharak halwa, thooli etc to name a few. Before your sugar rush drops, we move on to Khaaraas i.e. savoury dish. This usually consists of meat preparations which are fried or roasted as well as vegetarian curries, rice dishes and more. A good Thaal is incomplete without a combination of meat and rice. The meat dishes stay true to their ancient middle east genealogy and are prepared by boiling the meat in ginger, chilli and garlic paste, while the vegetarian preparations range from a simple pulao to salan and even kebabs. Popular derivatives of rice dishes are Bohra Khichidi, Kheema Khichidi, Bohra Biriyani, and of course Dal Chawal Palidu, drawing from the Bohra’s exposure to Gujarati cuisine. Mughlai dishes too, like kebabs, are a staple at any Dawoodi Bohra feast. 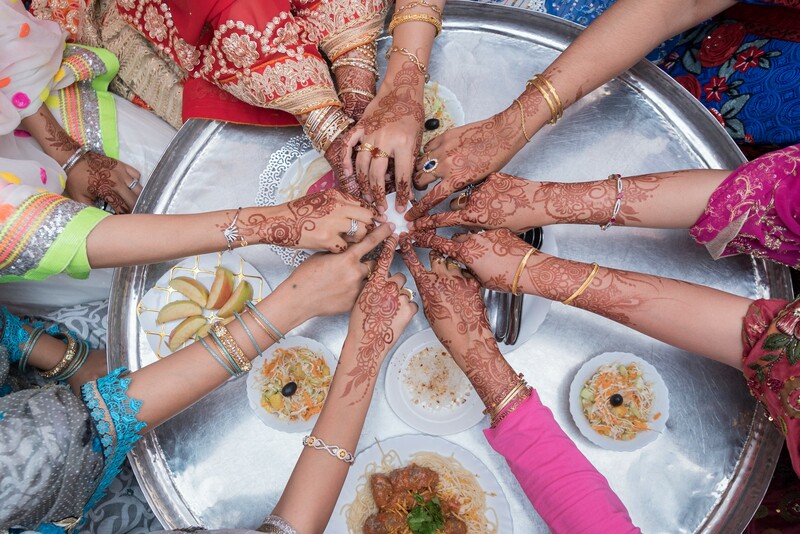 Over the generations, Dawoodi Bohra food has developed its own distinct style but part of its global popularity has also been our cuisine’s chimeric ability to take shape from an amalgamation of various regional influences. The concept of the Thaal is equally intriguing. This style of eating traces back to the very origins of Islam which believes in human equality and this reflects in the way we eat, where all the members of the community sit together around the Thaal and relish the food irrespective of their standing in society. Delving deeper into semantics, the round shape of the Thaal holds significance too as each person who sits around it, is equidistant from the food that is placed in the centre. This would be difficult to achieve in a rectangular or a square shaped dining table. So why do we sit down around the Thaal and eat? Food is sustenance and a blessing for every human. So as a token of respect and deep seeded gratitude, we humble ourselves in front of the food that nourishes us all and ‘sit down’ treating food with utmost importance. And it is this respect for food as well as our fellow community members that has led us to the unrolling of the Faiz al-Mawaid-al-Burhaniyah Programme (FMB). Through the FMB programme, hygienically prepared, wholesome meals reach each and every Dawoodi Bohra home. The FMB kitchen is now spread across 40 countries and serves an estimated 550,000 people around the world. What is most gratifying, is that this meal service bridges the rich and poor aberrations of the society and allows the women of the community more time and freedom to step out from the confines of the hearth to wider horizons of working on their professions, skills and hobbies. Yes! we love food, and if you want to taste our exquisite hospitality, culture and cuisine, we would love to invite you to join us for a hearty meal around our Thaal that is a nucleus of our illustrious community.